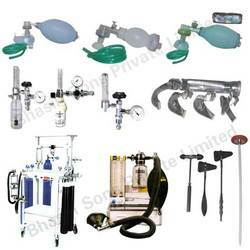 Providing you the best range of hospital equipments with effective & timely delivery. We are comprehensively engaged in offering a wide range of Medical Equipment. These products offered by us are developed using high end technology and modern machinery in strict adherence with the international quality norms and standards. In addition to this, the offered range is checked utilizing stringent measures to maintain its authenticity throughout the manufacturing process. Gowland type with black painted Al.